BISMARCK, N.D. – Friday, September 28, 2018 is World Rabies Day, a global day of action to prevent rabies and promote awareness. Rabies is preventable through vaccination, yet nearly 60,000 people around the world die from the disease every year. The North Dakota Department of Agriculture (NDDA) and the North Dakota Department of Health (NDDoH) are reminding the public to be aware of the risk of rabies. Rabies is a viral infection that affects mammals, including humans. In the United States, the virus circulates in wild animals and is most commonly found in bats, raccoons, skunks, coyotes, and foxes. Rabid wildlife can transmit rabies to unvaccinated cats, dogs, and farm animals, which then pose a threat to people. Rabies is most often transmitted through the bite of an infected animal. The virus can also be transmitted if saliva or nervous system tissue from a rabid animal enters open cuts and wounds or the eyes, nose, or mouth. The virus attacks the nervous system and causes swelling of the brain. There is no treatment and rabies is nearly always fatal. Keep dogs, cats, ferrets, and horses up-to-date on vaccinations for rabies. Your veterinarian can advise you on current vaccination recommendations. Try to keep stray animals and wildlife, especially skunks, away from pets and livestock. Do not leave exposed garbage or pet food outside, as this may attract wild or stray animals to your home or yard. Do not approach unfamiliar or wild animals. Learn how to prevent animal bites, especially to children. Teach children never to handle or approach unfamiliar animals without permission from a parent or guardian and the animal’s owner. Report stray animals or animals acting unusually to local animal control. Bat-proof your home to prevent bats from nesting inside and having access to people or pets. Do not keep wild animals as pets. It is unlawful in North Dakota to keep a raccoon or a skunk as a pet. Avoid contact with animals while traveling, especially internationally. 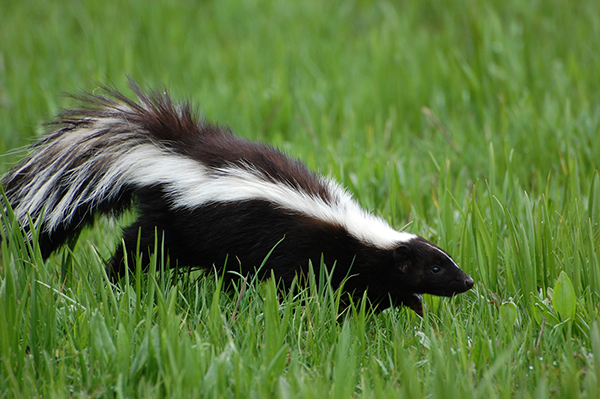 Skunks are the most common carrier of rabies in North Dakota. In 2017, 14 rabid animals were reported in North Dakota, 11 were skunks. Nine animals in North Dakota have tested positive for rabies this year, including three skunks, three cattle, a dog, a cat, and a bat. For additional information about animal rabies activity in North Dakota, please visit the NDDoH website at www.ndhealth.gov/disease/Rabies/. To learn more about rabies, please contact the NDDoH Division of Disease Control at 701.328.2378 or the NDDA Animal Health Division at 701.328.2655.